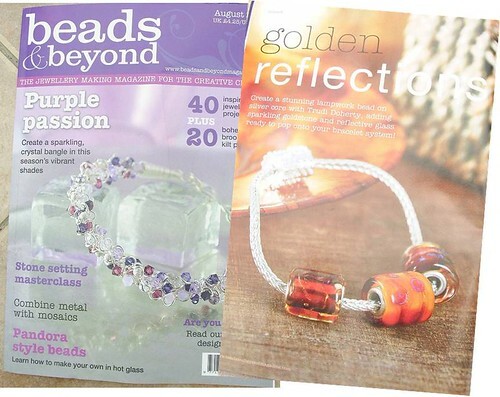 I'm very pleased that my tutorial has been published in Beads & Beyond (Aug 2010). The aim was to show you how to add hot glass directly onto a fine silver core, giving you the finished look without the need for expensive equipment! I'll gladly post up here any further information required and answer any questions! This wasn't covered in the magazine, but this is how I clean them. Soak in warm water for a few minutes to soften the bead release, and I use a soft cloth (old T-Shirt) and wipe the inside of the core and outer flange. I let this dry and then I dip in a silver cleaning solution (bought at most jewellers), dry and polish with a silver cloth! I don't have a tumbler - someone may be able to advise if it could be tumbled?